Among today’s polymer-frame compact 9mm pistols, there are a few we really like, and it’s a short list. One of them is the CPX from SCCY. 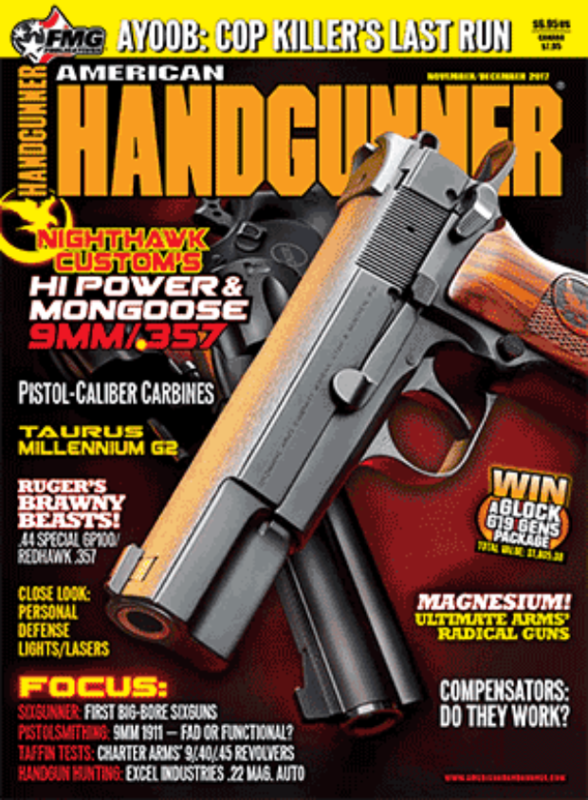 A few years ago, when it was introduced, I wrote about it here in Handgunner. Recently, SCCY has brought out several more good things, so it’s time for another look. The new offerings include a smaller .380 version, and some interesting color variations. We’ll get to both in a moment. For some of you who may have missed the earlier article, let’s look at the 9mm originals, the CPX-1 and CPX-2. Both are notable for quality and a surprisingly moderate price. The only difference between the two models is the CPX-1 has twin opposed manual safety levers, while the CPX-2 doesn’t. In both, the size and shape of the grip-frame are nearly perfect for the average hand. The CPX differs from a lot of today’s pistols in another way — it’s not striker-fired. It has a concealed pivoting hammer. This contributes to the smooth DAO trigger pull. SCCY says the trigger pull is about 9 lbs., but it actually feels lighter than this. The DAO trigger system is continuous, so if you encounter a hard primer, you can hit it again. Yeah, I know, instructors say to rack the slide, but I’ve also had many “duds” work fine on the second strike. Make your own decision, but at least you can do it with the SCCY. While we’re at the trigger, I’ll note it has no “flipper” safety in it. At the last shot, the slide locks open and the release is easy to operate. Sorry, left-handers, it’s only on one side, and the magazine release is not reversible. The double-column magazines hold 10 rounds. The CPX-3 is in .380 ACP and comes in black, or a simple two-tone. The CPX-1 9mm has twin safety levers while the CPX-2 leaves them off. The DAO trigger acts like a revolver so no external safety is actually needed. The locking system is a classic falling-barrel design. The concentric recoil springs are captive on a steel guide; nothing to fly away during takedown. The slide is 416 stainless steel, machined from bar stock, not a stamping. On all of the SCCY pistols, the slides are offered in black Nitride or matte stainless. Black is model suffix CB and stainless is TT. The low-profile sights won’t snag on the draw, and they’re square-picture, with three white dots. The dots are not matte, they are shiny, and catch even low light. The rear sight is adjustable for windage in its dovetail. Before writing this, I took my own CPX-2 out to the range, and it will still do center-of-target 4.5″ groups at 15 yards. Likely better, but hey, let’s just say my eyes aren’t what they used to be! If you count basic black, the high-tech polymer frames of the CPX-1 and CPX-2 are now offered in nine colors. And the new Kryptek Exclusives have a camo-like mottled appearance that’s quite striking. The new .380 comes only in black, but does have the slide finish option. Take-down is simple and fast. This is the 9mm CPX-2. The new .380, the CPX-3, has the same width and weight as the 9mm versions, but in other dimensions it’s a little smaller. Its most notable feature is the Roebuck Quad Lock. At four points, two at the rear and two up front, the barrel is fitted precisely to the slide. Every time the slide closes, the barrel is going to be in exactly the same position as it was for the preceding shot. An obvious accuracy factor. The CPX-3 has the same 10-round magazine capacity as its 9mm big brothers. There’s one feature not offered, the twin safety levers of the CPX-1. Actually, this makes sense as on a smaller, deep-concealment .380, that might be bothersome. The .380 is slightly smaller than the 9mm, but still not quite a sub-compact. The width and weight are the same, at 1.1″ and 15 oz. A comparison of the other numbers is in order here. The length of the CPX-3 is 5.7″ and the 9mm versions are 6″. In both, the height will vary depending on the magazine floorplate. Barrel length is 3.1″ in the 9mm and 2.96″ in the .380. With a locked breech, and the .380 cartridge, the CPX-3 requires less recoil spring tension, meaning an easy-to-run slide. The suggested retail prices for all three pistols are surprisingly low, considering the quality and features. For the .380 CPX-3, $350, the 9mm CPX-1, $284 and the CPX-2, $270. Frankly, that’s great value for the list of features you get. Thanks to American Handgunner for this post. Click here to visit AmericanHandguner.com. Better yet: Click here to see subscription options for American Handgunner and get it delivered to your home.